Yes, finesse fishing can often be the ticket when targeting finicky smallmouth bass but power-finesse fishing has its place. For Mark Zona, of Zona’s Awesome Fishing Show, he stumbled onto a rigging trick 15-years ago that changed the way he fished for smallmouth that he could see in super shallow areas. “The beauty of this rig is you hook and land everyone one. Also, I am able to cover an immense amount of water at lightning speed,” Zona said. 15 years ago, he was fishing a soft-plastic jerkbait at Thousand Islands, part of the St. Lawrence River system, in an area known as Guffin Bay. He had the soft plastic jerkbait tied on with a short leader of mono attached to a barrel swivel that also attached to the mainline. He was fishing an area with a tube and decided to mix the jerkbait into his approach. He was twitching the bait along when he developed a coil in his spool so he fired his bait out the other side of the boat to straighten out his line and reel it back in as he picked the coil out of his spool. “I threw that soft-plastic jerkbait out the other side of the boat and burned that bait in as fast as I could. It sounded like a child jumped in the water. When I hooked that fish, I never figured it would be a bass but sure enough it was a 5-pound smallmouth,” Zona said. Zona thought he could be onto something but he had to test it out. “I gave the rig to my buddy who was a co-angler and told him to throw the rig out the other side of the boat. It was unbelievable what I saw!” He watched smallmouth after smallmouth track the bait and inhale it. Zona has found that the technique works on both the Great Lakes and inland lakes from post-spawn through early fall bass. In fact, it’s a technique he’d learned from fishing for redfish in saltwater. Normally, anglers will cast out their soft-plastic jerkbait, twitch it a couple of times, kill it and let it sink for a few seconds then once the line tightens up, set the hook. This isn't’ how this fishing rig works. Zona will seek out isolated cover- a rock, a boulder, or a patch of grass. What happens next can go one of two ways Zona says. Tip: He’s also found that the faster he reels when he has a smallmouth fired up, the more likely they’ll commit to attacking his bait. Check out what KVD has to say about the Caffeine shad. Today, Zona’s rig consists of a 5-inch Strike King Caffeine Shad in one of two colors, Siren or Bubble Gum. He prefers the Caffeine Shad because it is a heavier bait that won’t pop and skip out of the water when he’s reeling it. The fishing hook, a Trokar Extra Wide Gap TK-125 is key because not only does it hold the bait in place but because the wire is a heavier gauge, it adds needed weight to keep his bait deeper in the water column as does the #2 Barrel Swivel he rigs up. “The size of the barrel, the size of my leader, the size of my hook, the whole thing has weight so that I can burn it under the surface so that it doesn’t jump out of the water. When I’m reeling it, I have it within 5-inches of the surface,” he said. He’ll run 30-pound Seaguar Smackdown to the swivel then on the opposite end of the swivel he’ll run 2-foot section of 15-pound Seaguar Abrazx fluorocarbon fishing line to his hook. Zona’s prefers a spinning rod for this rigging deal because he can make longer more accurate casts. He prefers a Daiwa 7’4 Daiwa Tatula Elite Cody Meyer signature series fishing rod because of its soft tip yet has plenty of back bone to drive the hooks home. The newly released 2500 Daiwa Tatula LT spinning reel balances the rod perfectly. 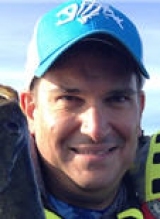 Jonathan LePera is a freelance outdoor writer and avid bass fisherman. You can find his work in Bass Times, BassFan.com, In-Fisherman Magazine and Bass Guide, and justfishing.ca. The Eastern Basin of Lake Erie and the Niagara River are his home waters where the smallmouth are big and plenty. He’ll chase largemouth anywhere they swim, they’re his favorite. Feel free to follow him on Facebook, Instagram, and Twitter.